Fecha y hora: 21, 22 y 23 de septiembre 2017, 10 am. Instituto de Matemáticas, Unidad Oaxaca. 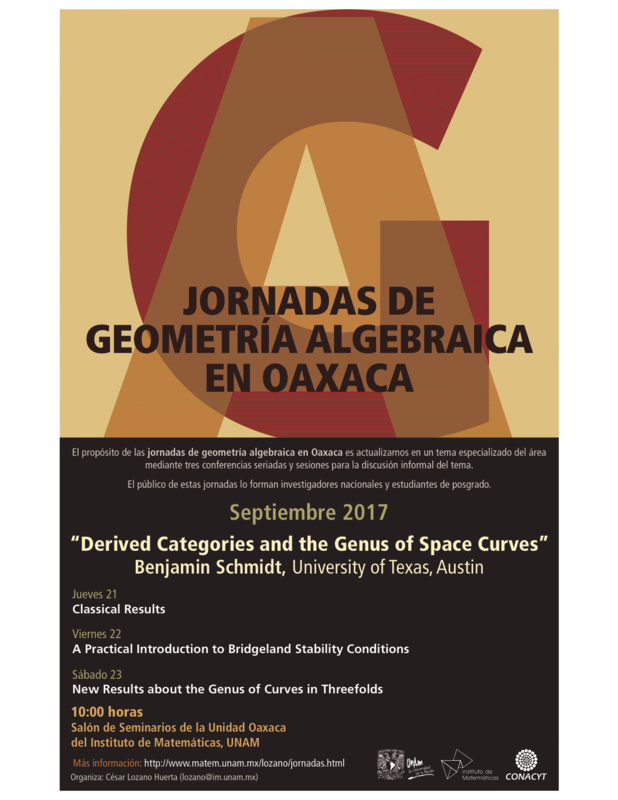 A 19th century problem in algebraic geometry is to understand the relation between the genus and the degree of a curve in complex projective space.This is easy in the case of the projective plane, but becomes quite involved already in the case of three dimensional projective space. In this lecture series I will give an introduction to the topic, introduce stability conditions in the derived category, and explain how the two can be related. This is based on joint work in progress with Emanuele Macri. Benjamin Schmidt (University of Texas at Austin).